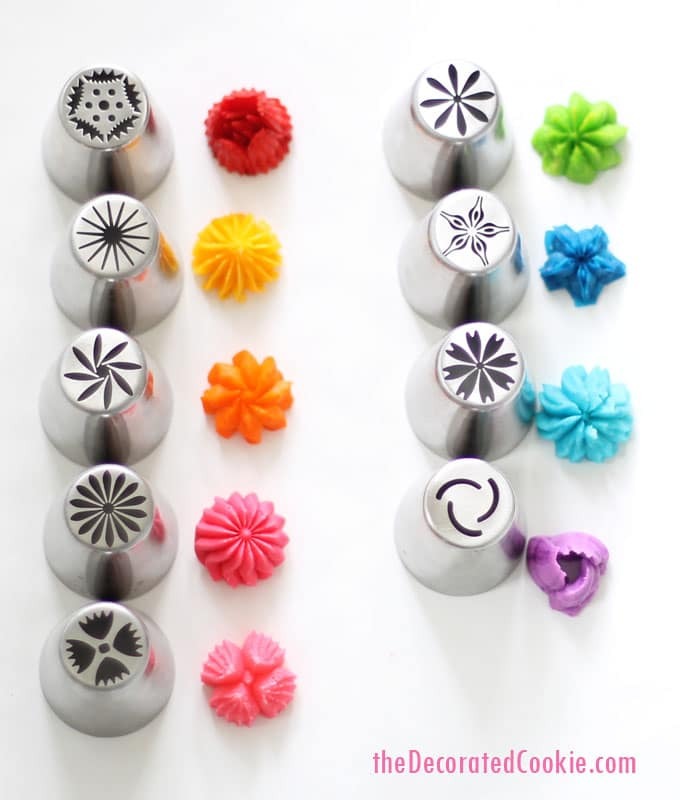 Russian piping tips: How to use decorating tips on cookies and cupcakes. 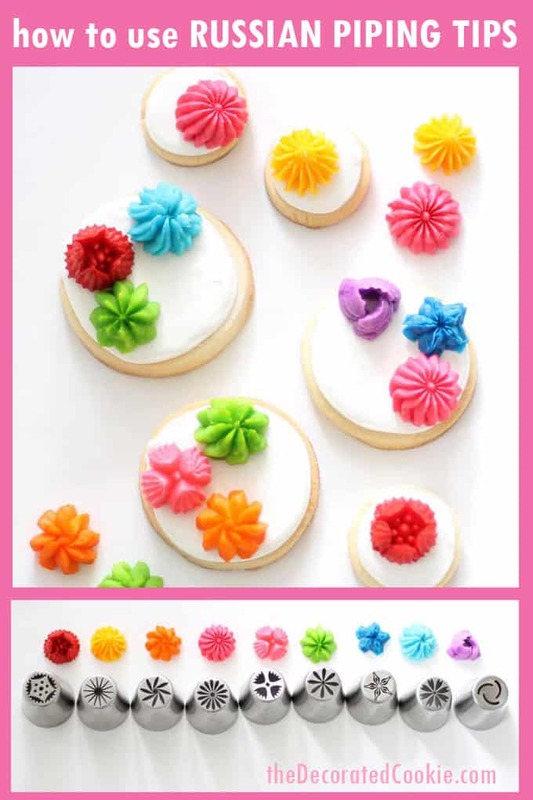 How to use the Russian piping tips to decorate flowers on cupcakes or cookies. I have been eyeing this 9-piece set of big flower decorating tips for awhile now, and I decided to just order them already. A few folks on facebook told me that AliExpress has them for less money, but that they take weeks to arrive. When I ordered the Russian piping tips from amazon, they were available on Prime, and it looks like they are no longer (though they are available for Free Shipping). So keep your eye out for changes at amazon. I do like them, a lot, although I prefer smaller decorating tips rather than the huge ones because I find them easier to wield. It’s best to use the larger, 16-inch disposable decorating bags with these, although I had to stick with my smaller ones since I was out of the larger. UPDATE: If you want couplers so you can change the tips on the same color frosting, THIS LARGE ATECO COUPLER does fit. If you use a stiff buttercream frosting with the Russian piping tips, they work well. Although I would prefer a smaller set of tips for less money, since I a few of the tips are similar. For the frosting, I used my recipe for buttercream frosting, adding only three tablespoons of milk. 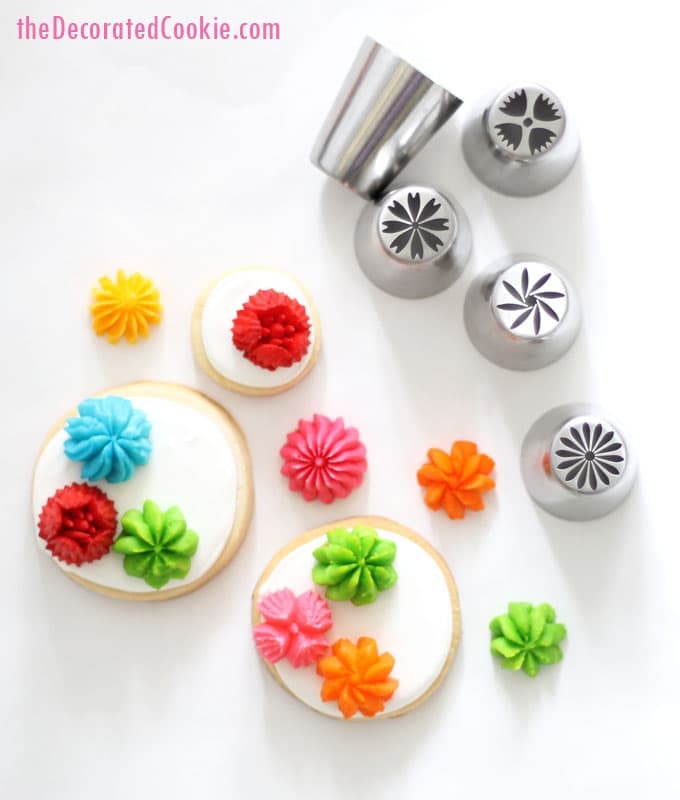 If you’re using another recipe that’s thinner (or, if you’re using store-bought frosting, which is not stiff enough), to thicken your frosting to a stiff consistency, you’ll need a good bit of confectioner’s sugar. Confectioner’s sugar is very fine, so you’ll need more than you think. However, be sure not to make the frosting too thick, or you’ll have trouble squeezing it out of the decorating bag. 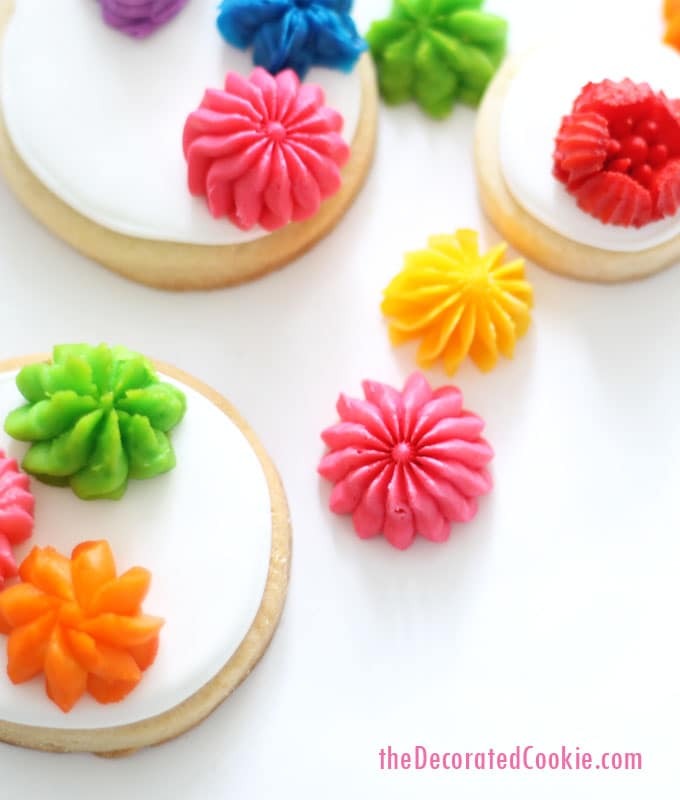 You want to squeeze the decorating bag easily, but the frosting should still hold its shape. 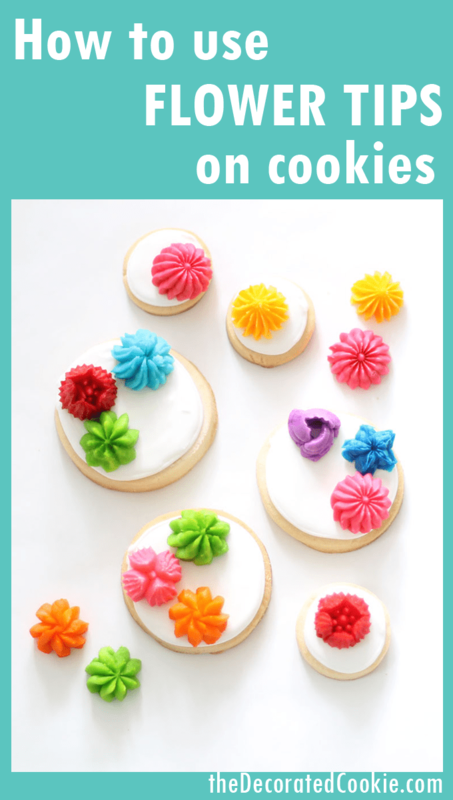 Note that royal icing is NOT recommended for these decorating tips, as royal icing doesn’t hold a three-dimensional shape as well as buttercream frosting. For the food coloring, I used my trusty Americolor Soft Gel Pastes, of course: Red Red, Orange, Egg Yellow, Electric Green, Sky Blue, Electric Purple, and Electric Pink. I lined a baking tray with wax paper and piped frosting on the tray. You may need to use your fingers to secure the flower as you pull the bag away. Let the frosting set well, several hours, before removing from the tray. 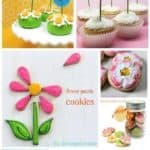 Then, you can decorate cookies, cupcakes or cakes. 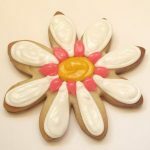 Adhere the flowers with dabs of frosting. 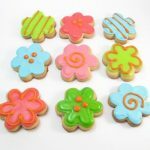 OR, pipe flowers directly on your cookies, cupcakes or cakes. FIND THE BIG FLOWER DECORATING TIPS AT AMAZON. Like this idea? 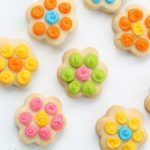 You might also like these how-tos for decorating mini cupcakes with mini flowers or these how-tos for decorating sunflower cookies. Thank you for the blog! I bought these tips, but haven’t played with them yet. Thanks!! Where do you buy the tips at ? Thank you Susan! I debated ordering from AliExpress, but ugh, last time I ordered from a company that shipped from China it was a disaster, so I just couldn’t! Good to know for future, too!! Ordered the same set from Amazon but haven’t had a chance to play yet. Your choice of colors along with the ahapes are jusr beautiful! Try Amazon. Ordered and received them the same day. Still to experiment though. Any clue if there is a coupler available for these tips? I want to be able to change out tips so I can play around with them and learn to use them. Thank you for this post!! Great question! I wonder if this one would fit? I’ll order one and test it and let you know!! These are gorgeous! I have 3 different sets and love them all. Very fun to play with! Thank you Jamie! You just reminded me I need to pull them out again. Love them too! Could I pipe some in thick royal icing and let them dry for later use ? Hi Dianne, If your royal icing is quite thick, you could try.BUT… Buttercream is better for this size (but of course that doesn’t fully dry like royal icing). Royal icing is better for smaller flowers and flatter designs to dry for transfers later. I feel like it collapses more easily, and if it’s really thick, might be hard to pipe. Please, give me your recipe buttercream!